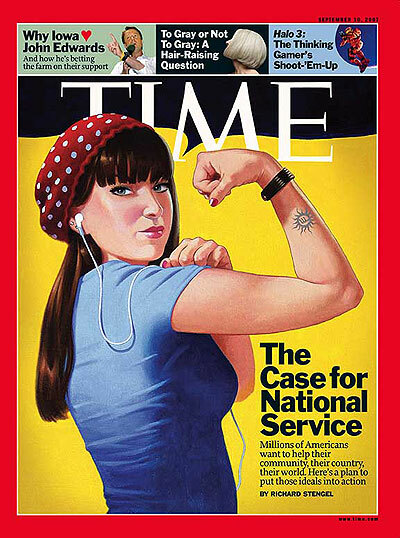 A report on national service by one of our national news magazines is a good thing but what message do Time’s editors choose to emphasize with the cover art? National Service is, or could be, a good thing. (Full disclosure, I never served in the military, Peace Corp, Vista or any other kind of National Service myself.) The problem is that the magazine slants its National Service coverage toward the issue of youth and service and away from what elders are already doing to advance the common good. This framing is consistent with the dominant cultural theme which says: “Old Age Equals Decline.” If that was true (and it is not) then the only hope for our society would lie with the young. In fact, we live in a time when there is an unprecedented opportunity for young and old to be together, work together and make change together. The model who sat as Rockwell’s model is now an 83 year old grandmother. 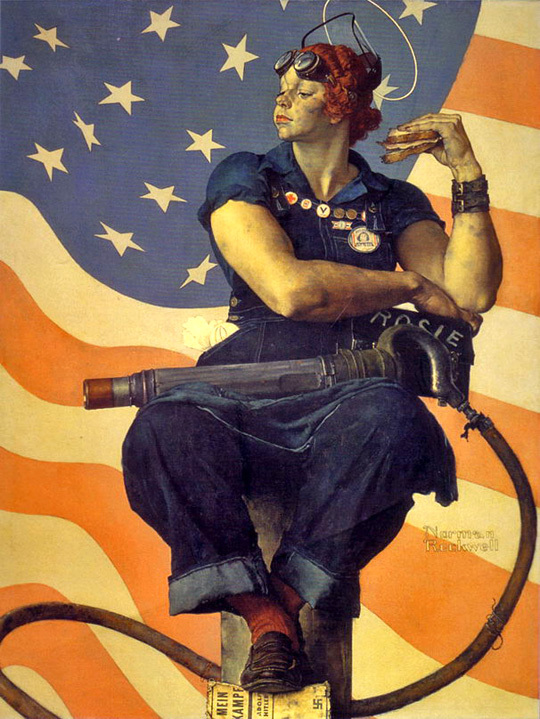 The iconic image of the original “Rosie the Riveter” remains powerful image because, even six decades after it was made, it retains the capacity to remind us that some things are worth struggling for and sometimes the struggle for the good can be found close to home– in our own neighborhoods and communities. So- in the spirit of Time’s Rosie Remix, I have a challenge for UMBC’s Visual Arts/Graphics Majors— Make me a remix of the Time cover that gives that poor woman on the cover a mighty mane of Gray Hair and some wrinkles. Send your Remixes to me at wthomas@umbc.edu and be sure to put “Remix” in the Subject line. I will post the best of them on this blog.